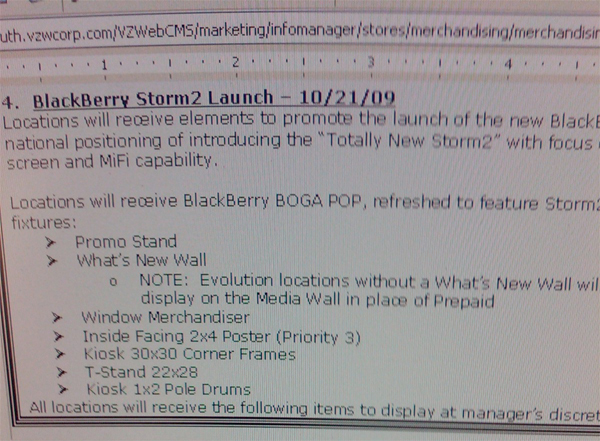 We can't confirm this Verizon Infomanager screen at this point, but if true, when the BlackBerry Storm 2 launches on the network, one of the big touted features will be its MiFi capabilities for sharing 3G internet over WiFi. It'd be smart branding move, sure, but MiFi is also the name Novatel uses for its hardware, so either we're talking here about an application of some sort or it's just internal communications short-hand. Also mentioned here is an October 21st launch, although it's been noted by Crackberry that the date's apparently been replaced with TBA. Without a doubt, we can confidently say we'll know for sure in the next, oh, 52 hours or so. Storm 2 hitting Verizon with 'MiFi capability?' originally appeared on Engadget Mobile on Sun, 18 Oct 2009 20:54:00 EST. Please see our terms for use of feeds.